12:15 p.m. My photo of a cap and banner cloud atop Mt. 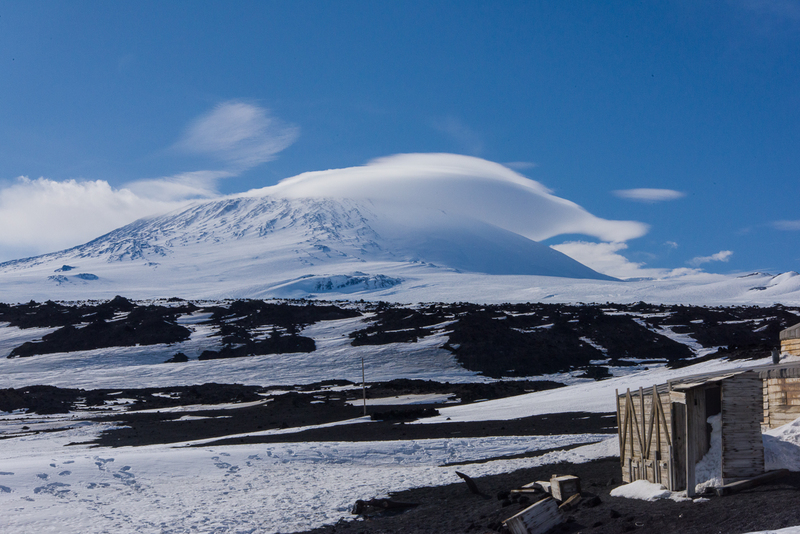 Erebus from Cape Evans is the Cloud Appreciation Society January 2016 Cloud of the Month. The cap is on the right and the banner is the streaming cloud on the left. The above photo of a cloud formation known as “cap and banner” is the Jan. Cloud of the Month on the Cloud Appreciation Society’s web site. You can also see it on their web site. I photographed it in Antarctica on November 25th, after traveling by snowmobile over sea ice for about 90 minutes to the historic Terra Nova Hut at Cape Evans. Here we are heading out onto the sea ice for a snowmobile trip to Cape Evans. I’m the 3rd one in line. 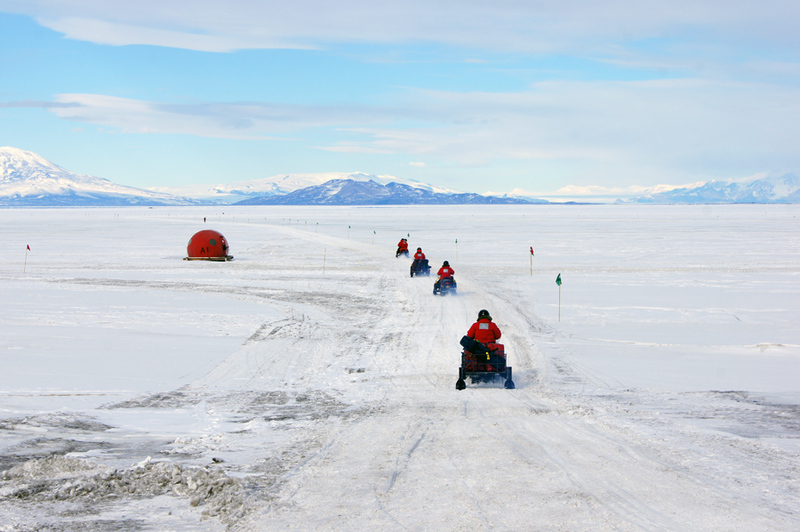 One of the many aspects of the Antarctic experience I never anticipated was that I’d be driving a snowmobile. The hut was built in 1911 for the 1910-13 expedition, led by British explorer Robert F. Scott, and eventually I’ll post some photos of the fascinating interior, which is filled with period tools and supplies the explorers left behind, including snowshoes for ponies (they brought ponies to Antarctica! on a ship! alas, it did not work out well), a taxidermy penguin, piles of 100-year-old cans of food and bottles of medicine, fur boots, old socks, etc. The Cloud Appreciation Society, a project started by Gavin Pretor-Pinney, the best-selling author (at least in England) of The Cloudspotter’s Guide has amassed a huge online library of cloud images sent in by cloud enthusiasts all over the world for the last several years. I submitted the photo after looking up Erebus on Google Images and finding nothing else like it. I thought it likely they’d post it eventually, but was pleasantly surprised to see they not only posted it immediately, but featured it. They’ve classified this particular cloud as a “cap and banner”. Erebus at 10:24 a.m. When we stopped for a break en route to Cape Evans that day, it was bathed in a glowing haze. In retrospect, I can see there was a little bit of a cap above the peak, but no hint of the drama to come. 11:50 a.m. 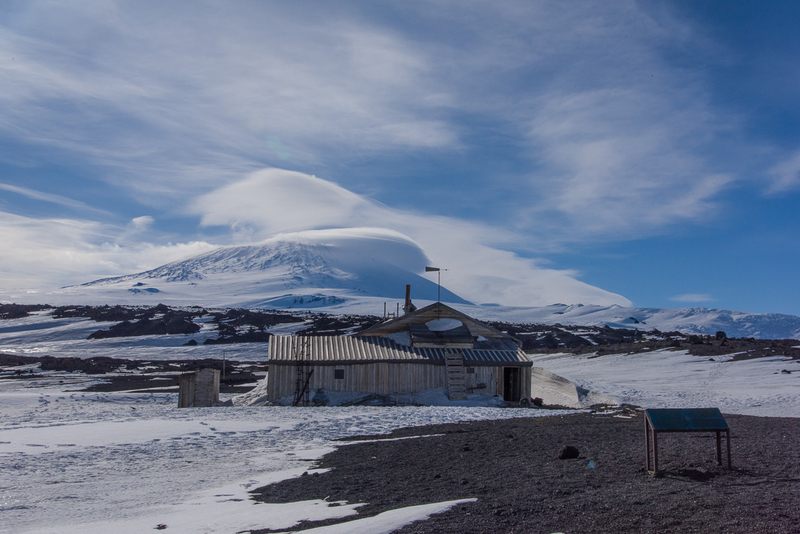 The Terra Nova Hut exterior was the subject of this photo, but the two clouds over the summit in the background caught my attention. I ate my lunch and walked around outside, keeping an eye on it. 1:00 p.m. Ten minutes after what turned out to be the best shot the cap cloud was spreading out and losing its lenticular shape. Still an impressive banner on the other side of the volcano, though. So, in between two walks through the hut, taking pictures, and a climb to the hilltop memorial cross to explorers who lost their lives, I kept checking on it. Looking back at the time stamps of the photos, I can see that I took my first photo of that cloud almost exactly an hour before I took the January Cloud of the Month photo, which I decided was most perfectly formed, and just 9 minutes after that, it was starting to flatten and become much less interesting. In between the first and last photo, I kept checking on it, because prior experience alerted me to the fact that (a) this was an unusual formation and (b) being a cloud, it wouldn’t last long. The fact that it had even drawn my attention when it was not the purpose of the trip, occurred to me as I read “How to Cultivate the Art of Serendipity” a thought-provoking New York Times article on how inventions come about by Pagan Kennedy, which was published a few days ago, on January 2nd. 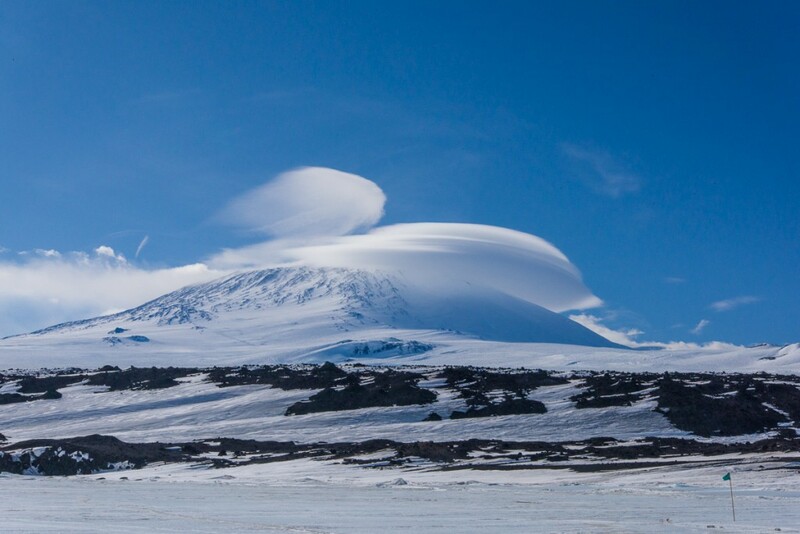 After reading Kennedy’s article, it occurred to me that the only reason I knew to attend to what was going on above Erebus that day was that when I was taking all those cloud photos I was reading everything I could get my hands on to understand how they formed and moved through space. The information stuck in my head, even though I never saw a lenticular cloud in person until November 25, 2015 when I took these photos. So was I lucky that the cloud came together while I happened to be there? Yes. But without the prior intellectual wandering which was really just because I found it personally enriched my experience of the natural world, I would probably have taken the shot above at 11:51 with the hut in the foreground and gone back inside, and missed the really great moment an hour later. 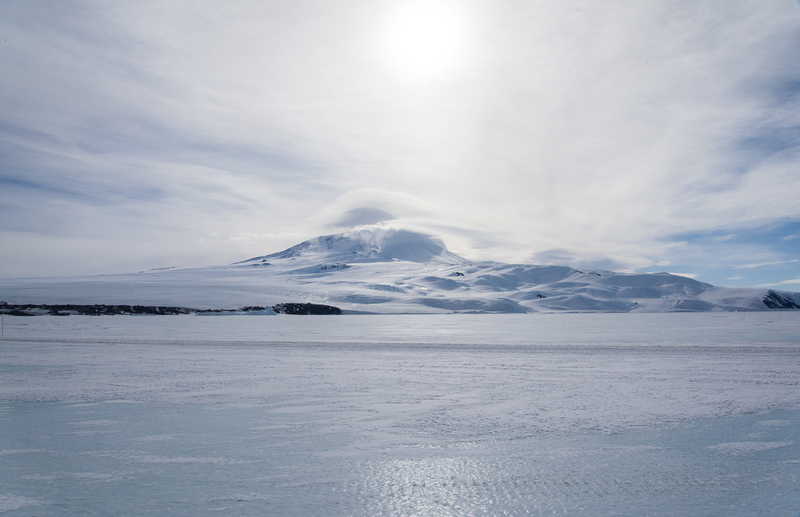 On January 4th, I left the ice, as the expression goes in the US Antarctic Program. I’m sitting in a hotel room in New Zealand typing this post. The last week I was in Antarctica it started to hit me that it was the last week I was in Antarctica. Travel for me is always a period of “super-encountering” that I simply need periodically, to recharge my batteries. But this is the longest trip I’ve been on in 40 years, and in the most alien, unfamiliar place I’ve ever visited. I generally had an idea what to expect, except that nothing quite prepared me for any of it. I wasn’t sure if it would be what I hoped; it was way more than what I hoped. I haven’t even finished posting material to this blog. There’s more coming as I work my way through it. And I found myself rising to the occasion to handle everything from being dropped into a field camp to live in a tent with people I had never met, to sleeping in a tent in 20-degree weather, to driving a snowmobile, seven hour hikes in cold weather, to realizing I could indeed make 3D captures of really, really large things — way larger than I’d expected. I met wonderful people and I also navigated the sometimes-quirky McMurdo social scene, a subculture with its own mores and routines shaped by communal living of adults of widely different ages and backgrounds living in a remote place. I couldn’t take anything for granted or predict what sight I’d come upon next. 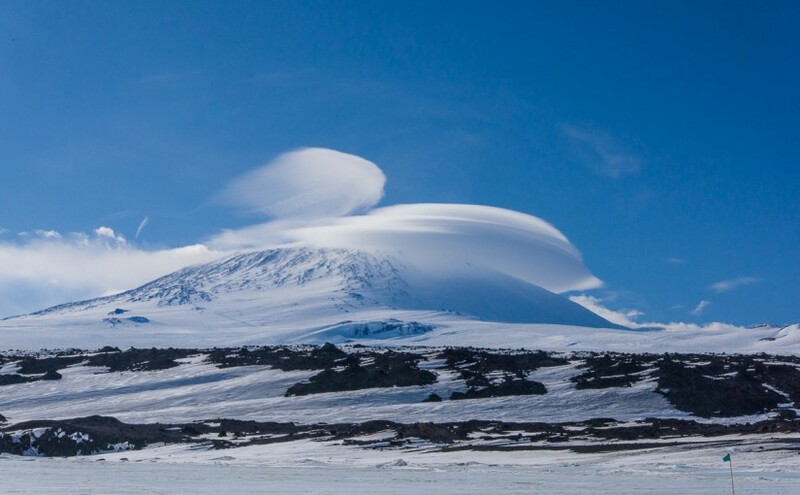 Along would come delicate designs in the lake ice, boulders carved into a surrealist sculpture garden, or even, for five minutes, a perfectly poised cap and banner cloud, spinning above a volcano.